Storing cork wine bottles upright for a short period of time is OK, but for any lengthy period of time is not recommended, you want to keep the cork moist. Make sure your wine is stored safely and also conveniently so your staff are able to quickly access a bottle if required. Avoid direct sunlight and make sure it isn't stored in an area where the temperature can rise and fall frequently, a near consistent temperature is ideal. Storing wine in a restaurant or bar is made easy with this guide! We want to help you store your wine safely and securely whilst ensuring quality and value of the wine for the customer. 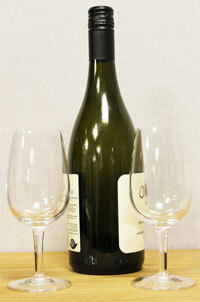 It is important to present and store your bottles of wine correctly as well as maximising your bar/restaurant’s layout. Small changes can make big differences for your company/business. Wine racks are the perfect way to store bottles of wine; they are practical and fit easily in most spaces both big, small and even awkward! They are available in a number of different materials including wood and metal. 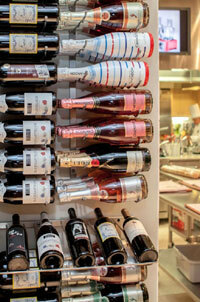 Alternatively, you can opt for a wall wine rack to innovatively display and visibly portray bottles of wine. This is extremely popular with modern bars who want to really showcase their wine list to its full. Wine cabinets on the other hand are the ideal way to store wine bottles correctly and conveniently. Wine cabinets are available in a range of options including single temperature, 2-3 temperature and multi-temperature as well as different style designs, including worktop wine cabinets and free-standing wine cabinets. The type of wine cabinet is dependent on your company’s (bar/restaurants) needs. A restaurant or bar is ‘part of the selling of wine’ so make sure the presentation of the various bottles of wine is both appealing and attractive to your customers. The presentation of wine helps customers choose their wine so use this to your advantage. Neatly arrange a good and varied selection of wine on offer; ensure you present a range of different priced bottles (from low to high). This gives you the opportunity to let your creative side take over. A good tip for any restaurant or bar is to present bottles of wine near glassware as this not only looks fantastic but provides an organised setting for members of staff. All glassware should be polished regularly to maintain sparkle and cleanliness. Another advisable point is to make sure your staff are aware of the appropriate glassware to use for ‘said’ drink. This can be achieved and reinforced by holding glassware training sessions on a regular basis to remind staff which glass should be used for each drink. This will create happy and confident staff as well as satisfied and (hopefully) returning customers. These small changes can make the difference between an average bar or restaurant to an exceptional bar or restaurant with fantastic customer service! Above all else make sure you show-off your wine collection innovatively and impressively. First impressions really do count! We can advise you on the appropriate wine rack suitable for your bar or restaurants so please do not hesitate to contact us for a FREE quote. Noticeable – drinks bottles (including labels) should be visible for the customer and staff. Appealing – the layout and selection of wine bottles should reflect both variety and region. Maximum space – utilise your bar or restaurant drinks space fully. This can be achieved with shelving options, wine racks and wine coolers. Exclusive – make sure you have a daily changing board of special or feature wines. Atmospheric – make your bar’s appearance warm, welcoming and enticing. Create small drinks boards on the opposite two ends of your bar so your drinks menu can be viewed from around the room. Keep wine away from direct UV rays and light as this can cause premature aging of the wine. Monitor the humidity levels of your bar or restaurant. Store the wine bottles sideways so the corks remain moist. Keep the wine in a vibration-free environment (or as much as possible). Regularly check your wine stock levels. If you require any further advice on how to store wine in a restaurant or bar, or any other drinks-related enquiry then please contact us today! We have an experienced team who are more than happy to answer any of your questions. We also love to hear new ideas on how best to store wine in a bar or restaurant. Send us any ideas or photographs storing wine in a commercial setting. We might even feature these in this guide or on our website!